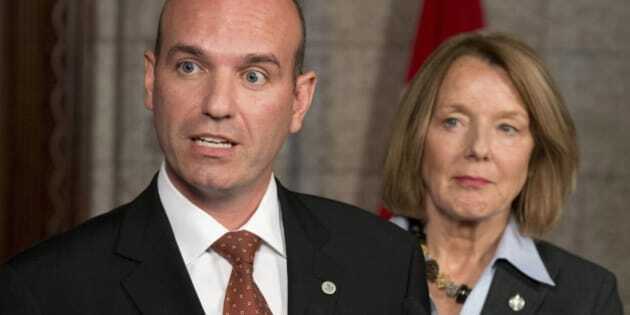 It's not every day that a promotion means you lose out on $40,000, but that's precisely what happened to NDP MP Nathan Cullen this week. On Thursday, NDP Leader Tom Mulcairshuffled his shadow cabinet and moved Cullen from Opposition House leader to the high-profile role of finance critic. Cullen will take over from Toronto MP Peggy Nash, who is now her party's industry critic, while British Columbia MP Peter Julian will take over minding matters of parliamentary procedure for New Democrats. The new gig will mean Cullen, a fluently-bilingual, rising star who considered running for the leadership of the B.C. NDP, will now go toe-to-toe with new Finance Minister Joe Oliver. Cullen will get more airtime and soon find his name in more newspapers. And if Mulcair should resign after the 2015 election, this new promotion could make Cullen, who finished third in the 2012 NDP leadership race, the front-runner to replace him. The shuffle means that Cullen loses the $40,600 stipend that will be given to the Opposition House leader, on top of the base MP salary of $163,700, for the 2014-2015 fiscal year. That salary boost, up from $39,800, now goes to Julian. Cullen, who has two young children, will receive no extra pay for serving as finance critic. Ouch! Thanks a lot, boss. The role was considered an "expensive promotion" by journalists on Twitter Thursday, but Cullen reminded Postmedia reporter Stephen Maher that it comes with the "added bonus of time with the effervescent Joe Oliver." Cullen, who famously clashed with Tory House leader Peter Van Loan in 2012, also wished Oliver well. @nathancullen Thanks for your good wishes. See you in the House on Monday. Back in September, when Cullen was weighing a move from federal to provincial politics, the Vancouver Sun's Peter O’Neil pointed out the MP would take a financial hit, even if he became premier one day. The salary of British Columbia Premier Christy Clark is $193,532. But with his MP salary and House leader stipend, Cullen made $200,000 last year. But as the old saying goes, money isn't everything.